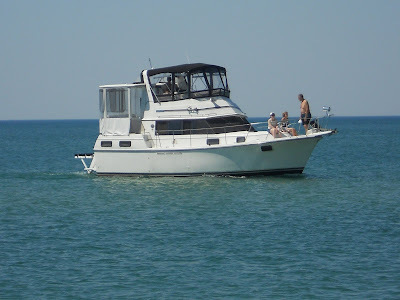 Lake Michigan (and beyond) Boating Adventures: Executive Decision makes her debut! The newest member to the family fleet, Executive Decision, made her maiden voyage with Captain Bill (Ben's dad) at the helm and guests enjoying the cruise onboard. (Ben's mom, Kathy, is riding on the bow in the photo) Bill purchased the 36 ft Carver Aft Cabin and delivered it just a few weeks ago. 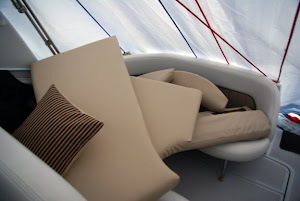 Welcome to boating life! Be careful... it's addicting! This photo was taken outside the dunes in Chesterton on Saturday, as we enjoyed the beautiful (hot) weather and smooth cruising conditions. We had a nice lunch and playtime on the beach with family before getting kicked off! (turns out you can be IN the water, but not ON the beach) We look forward to many more family excursions on the lake this summer! Thanks for the great pix, Dana! I was thrilled to finally take Executive Decision out on the lake and see how she handles. The weather was perfect, the lake calm and the motors were purring like kittens. I hope you and Ben can come for a ride soon.